When the Mazda exhibit opens in the Los Angeles Convention Center this Friday, attendees will get the first North American close-up look at the 2014 Mazda6, 2014 CX-5 and a new Mazda racecar, plus the new SKYACTIV-D 2.2-liter clean diesel engine. The CX-5 has been updated for 2014 and the CX-9 gets a new countenance for 2013. 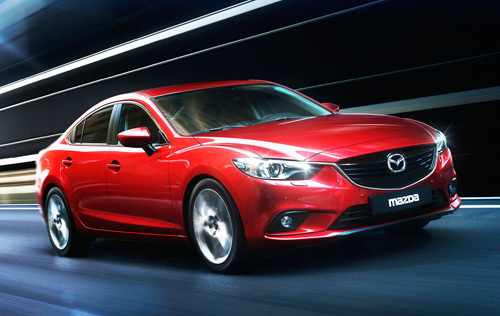 Along with the all-new 2014 Mazda6, they will all be at dealerships during the coming winter months. A global debut from Mazda Motorsports and information on which US models will have the option of the SKYACTIV-D engine will also be released. “It's definitely an exciting time for the Zoom-Zoom brand," said Jim O'Sullivan, president and CEO, MNAO. "The long-awaited, redesigned 2014 Mazda6 will naturally receive much interest, but let's not take away from our strong SUV lineup in the CX-5 and CX-9, which are segment leaders in their own right. Motorsports, an innate part of Mazda's soul, will have important news to share and last but most certainly not least SKYACTIV-D will be here. I have no doubt that consumers will look at Mazda's upcoming lineup with wide eyes, stirred hearts and driving inspiration." The 2014 Mazda6 is the second production vehicle, following the CX-5, to be redesigned from a clean slate, emulating Mazda’s Takeri Concept and portraying the KODO or Soul of Motion. It will feature a new SKYACTIV-G 2.5-liter gasoline engine as well as new safety technology in the Smart City Brake Support (SCBS) system, designed to prevent or lessen the impact in front-end collisions at low speeds. A new Mazda-developed, capacitor-based brake energy regeneration system is a new way to enhance the vehicle’s efficiency. The 2014 CX-5 also will receive the SCBS system as part of an option package, but will not be equipped with the regenerative braking system. Both vehicles go on sale in January 2013. Arriving at Mazda dealers now, the 2013 CX-9 received a nip and tuck to give it a new face, and also incorporating KODO design in the front and rear fascia. The seven-passenger SUV also gets more tech savvy with Mazda's new audio and infotainment system with a 5.8-inch color split-image touchscreen, updated Bluetooth audio and phone connectivity, TomTom in-dash navigation, HD Radio, Pandora and Short Message Service audio text reception and delivery. Mazda Motorsports is bringing an all-new competition race car, which will make its track debut next January at the 2013 Rolex 24 at Daytona. The vehicle features a turbocharged SKYACTIV-D 2.2L, to become the first diesel-powered competitor in the 51-year history of the 24-hour race. Despite its track pedigree, the diesel engine remains 63 percent original stock. Mazda will be attempting to earn their 24th motorsports class win. Only the 2014 model, Sheesh, I think I'll hold out for the 2015 model coming next summer.